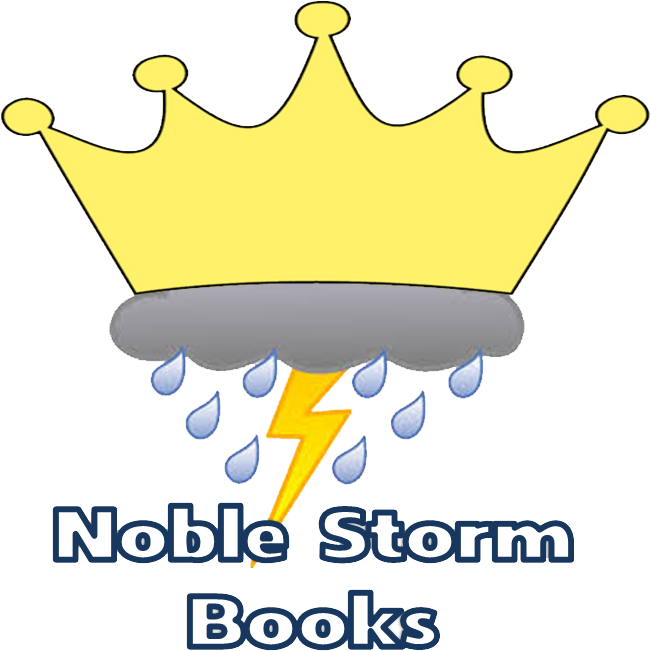 So I have not been able to keep up a daily blog posting schedule, not yet anyway. I am therefore going to shoot for at least a weekly if not a bi-weekly update schedule. For today I'm going to talk design. Maybe it's because I'm an engineer by training but bad and/or inconsistent designs have always bugged me. I will not say that my own designs are perfect but I have always tried to keep my designs consistent and believable. For this design day post I'm going to go over the progression in design of one of my own craft. 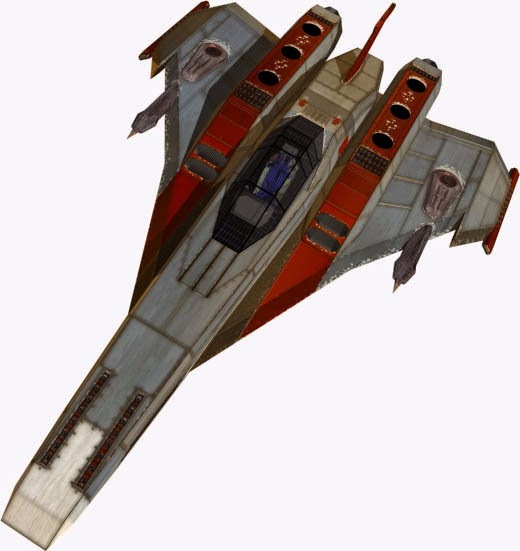 The Splicer-1000 "Dagger" fighter/trainer that plays such a critical role in Spiral War: On Dagger's Wings. 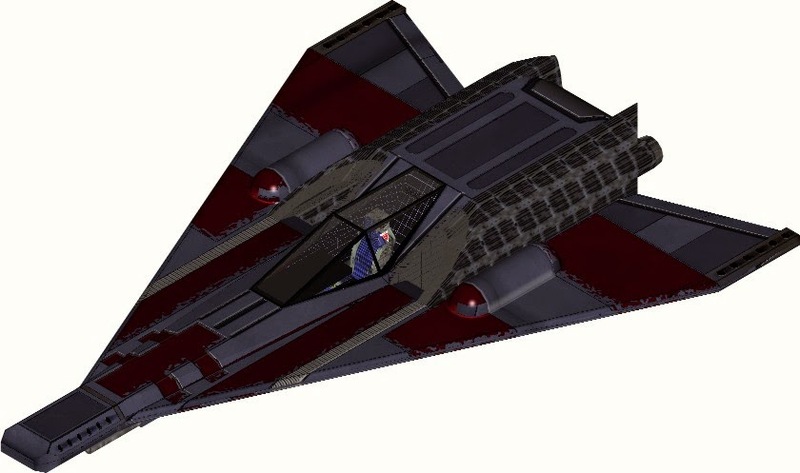 My original inspiration for the Splicer 1000 was a cross between the venerable X-Wing fighter from Star Wars and the proposed delta wing X-15 rocket plane. 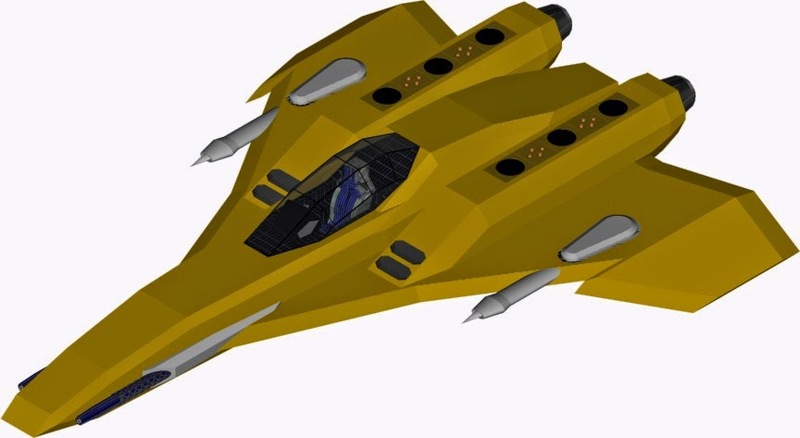 I wondered what it would would look like flipped over and with a delta wing instead of its trademark split wings. 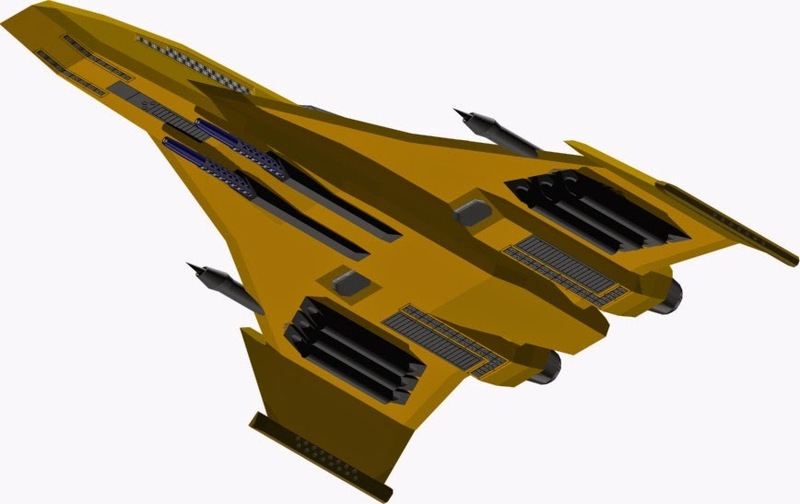 The overall design was locked in earlier than this, a delta winged single seat light fighter with a mid-fuselage mounted cockpit, with twin engines, fuselage mounted weapons (story concession) and wing mounted missiles (in the pods). It also features obvious thermal radiator wrapped around the engines and sensors in the wingtips. The texture maps here were cribbed straight from the old X-Wing alliance game. I had no skill with them at the time, and it shows. The overall design here is not much changed, but I attempted to add details and some realism via textures and subtle additions. 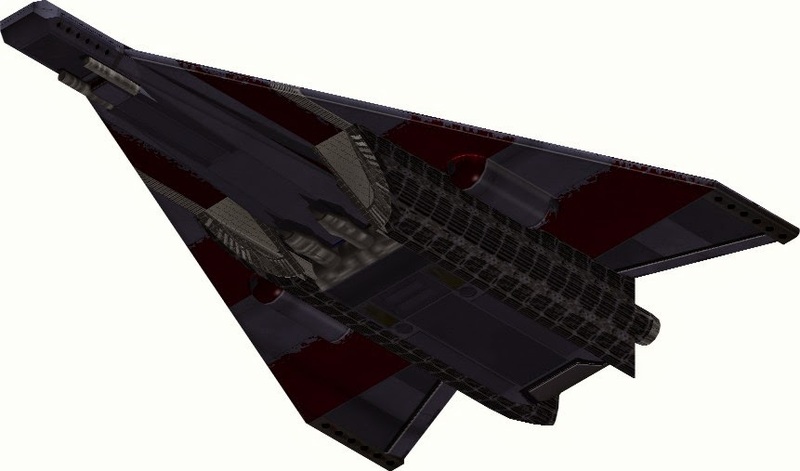 The craft now features maneuvering thrusters in the nose and wingtips, along with runners of the cockpit to open and an actual cockpit interior. The reverse thrusters are still pretty rudimentary but I added some basic maintenance hatches, the landing gear bays, and moving control surfaces for atmospheric flight. In 2005 I upgraded my autocad package and with it began a serious redesign effort of all my craft. For the Splicer 1000, I wanted to start from the ground up and threw out the whole design, but endeavored to keep the major salient features, final result seen above. 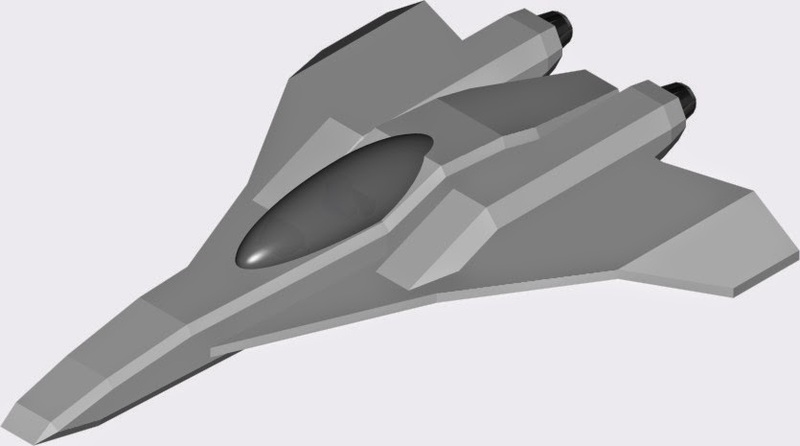 I kept the delta winged design, but made it more of a cranked arrow similar to the F-16XL. I also gave the outer section an anhedral, dropping it down. 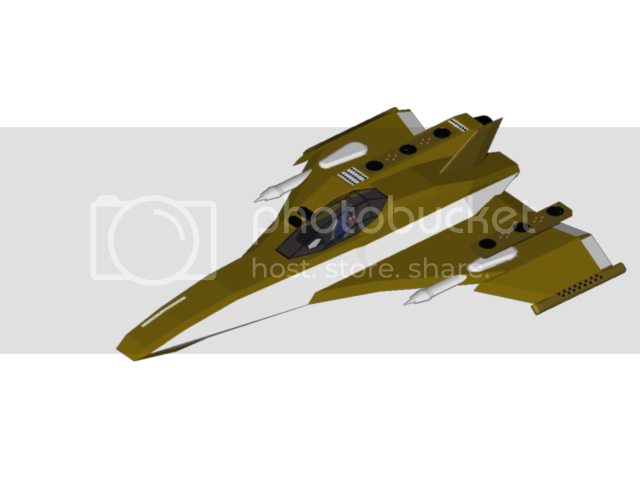 The inakes of the earlier design are gone, replaced with simple reverse thrusters. And I added a ton more maneuvering thrusters, this are space fighters and with damage expected I wanted plenty of redundancy. I also redesigned and moved around the weapons, keeping the plasma laser cannons on the belly, and added new external missile hardpoints. Around this time is when I first really started documenting my design work. This is how the design started, a grey blocky mess. 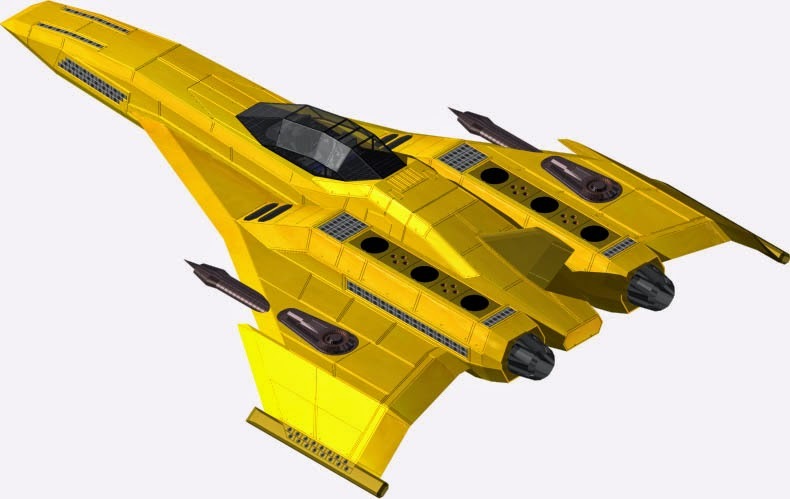 In short order I gave it a quick yellow color scheme to match with the standard cadet colors I described in the novel, added weapons, chamfered the wings to give them a more realistic shape and replaced the ovoid cockpit with something more angular and framed in looking. 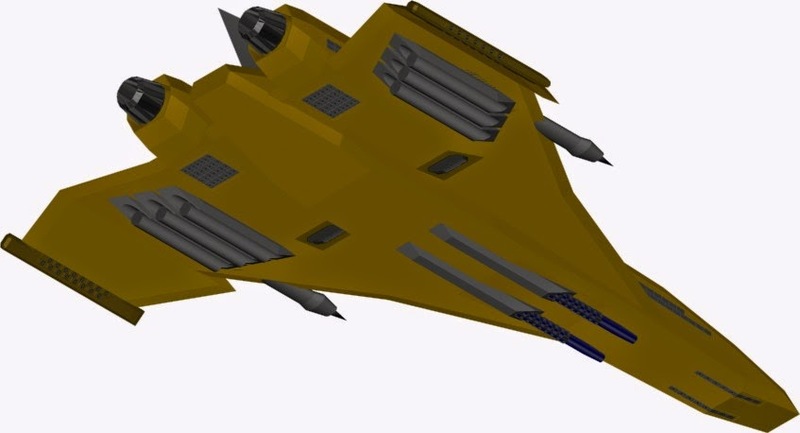 In short order I darkened the color and shifted around the weapons, burying the larger cannons in the wings and I added the docking claw hardpoints to the engines. These were something I always toyed with. 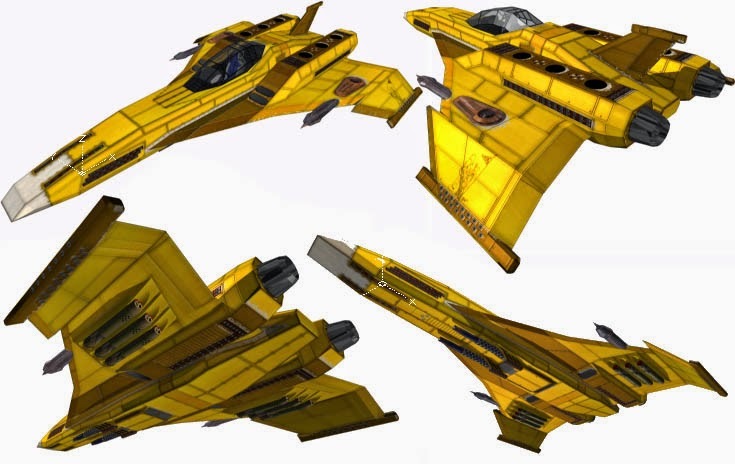 The fighters could launch or "land" on their motherships via arms that would extend and hold them in place. Power could be recharged, fuel tanks filled, as well as life support systems. I also cut in the reverse thrusters. 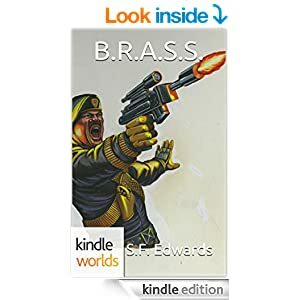 Next came the first version of the thruster emplacements and the moving of the Plaser cannons to a better location, that also fit the book narrative better. 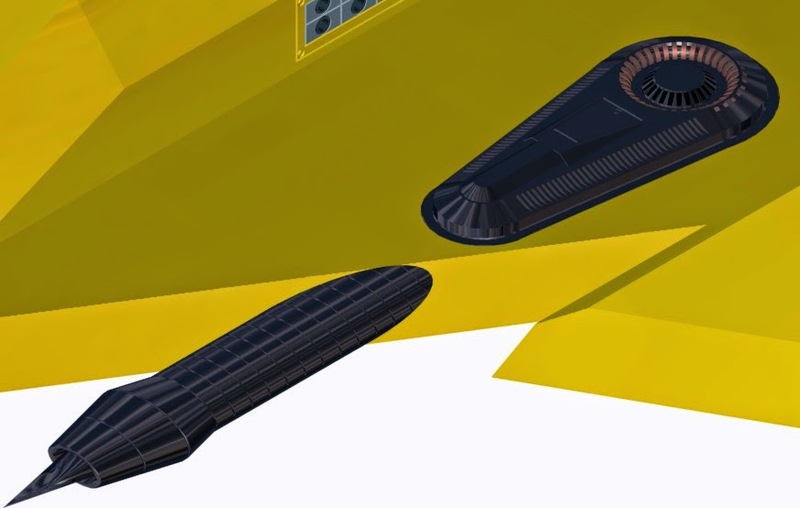 There is also a vertical stabilizer there and the early wingtip sensor pods, upon which more thrusters are emplaced. The landing gear came in next, which necessitated redesigning some of the thrusters and their placement. Even is science fiction design compromises take place, at least if you want to maintain a sense of realism. 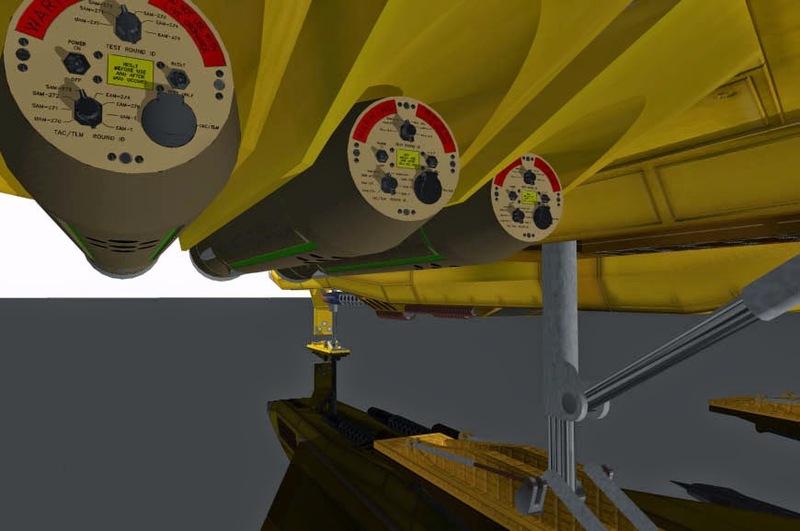 Speaking of realism, these missile simulators for the trainer version are actually based on the CRS/PRS RAM simulators I helped to design during my time working at NAVSEA PHD. 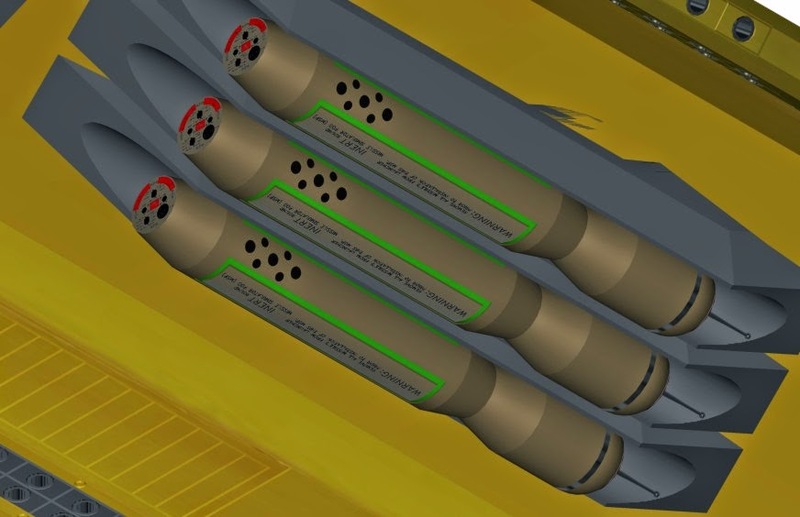 While on the subject of weapons, check out these close ups on the guns. Notice all the thermal radiators built into each one. Weapons in space will get hot, and they need expel that thermal energy away somehow. At this point, the design has pretty much come together, complete with cockpit. Now comes the DETAILS. This shot does a good job of showing all the panel lines I cut in to make the craft look more user and maintainer friendly. Finally come the textures. These really help the design come to life, showing wear and tear and dirt marks show that a craft is used and real. Now, notice how there are no giant thermal radiators in this design? 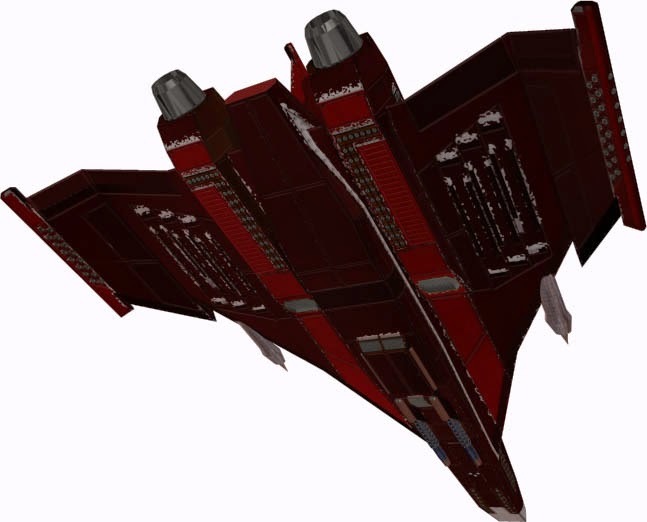 For this generation of designs I changed my text base, the wings help serve at the thermal radiators as do the thrusters themselves when not in use, and internal heat sinks. Round about 2011 I decided to redesign my craft once again. I had just completed re/modelling some of my enemy craft and now the hero craft didn't meet the same standards. 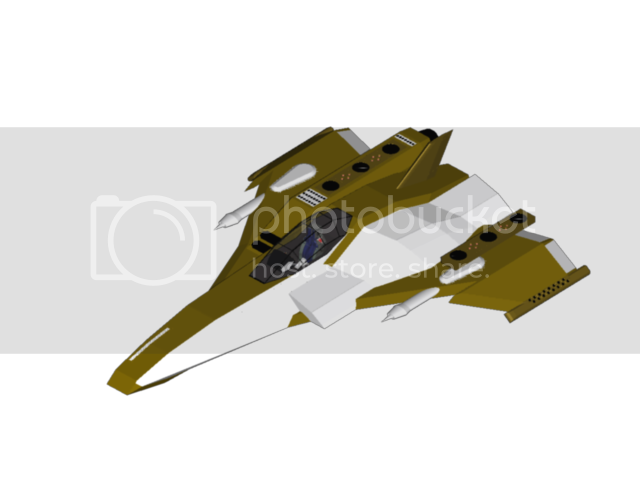 Also, the means by which I textured the craft had changed too, and the old method made it a serious pain to change color schemes. As these things do, the redesign started small. I like most of the old model, so I wanted to preserve it as much as possible, but change the parts that bugged me most. I started by stripping away the old engines, but kept the parts on them that were most important, in this case the docking points. From there I cut in a new, blended fuselage and engines. A whole lot of cutting and chamfering later and I added the docking points back in, though they are angled this time. This highlights one of them major design changes, the engine size and shape. I went with a more octagonal exhaust this time with more details inside the engine itself. See the old jet engine style exhaust on the old engine to the right. 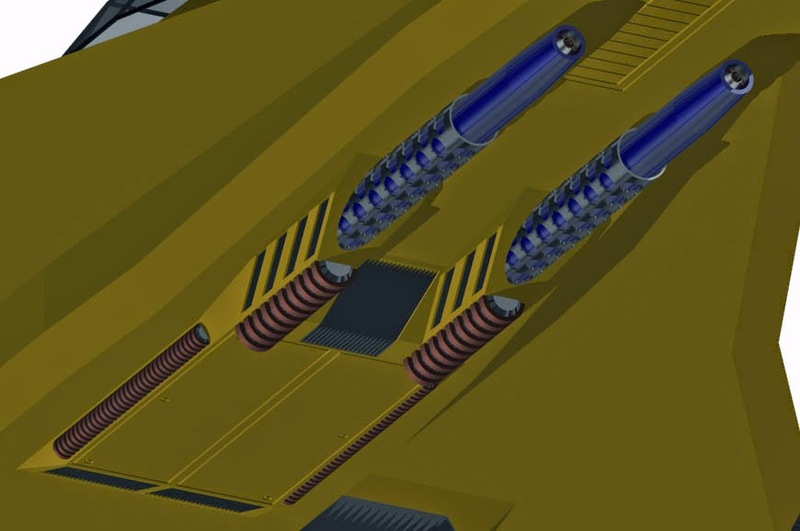 With the main engines redesigned also adopted this clamshell design for the reverse engines. This cleans up the profile of the ship for atmospheric flight and still allows a measure of thrust vectoring of the plasma exhaust. A nice closeup of the cockpit, notice the minimal railing this time around, though I still need to redo that HDD console. At this point, the single vertical stab just looked out of replaced with twin stabs. Also, chekc the mirror image beneath. 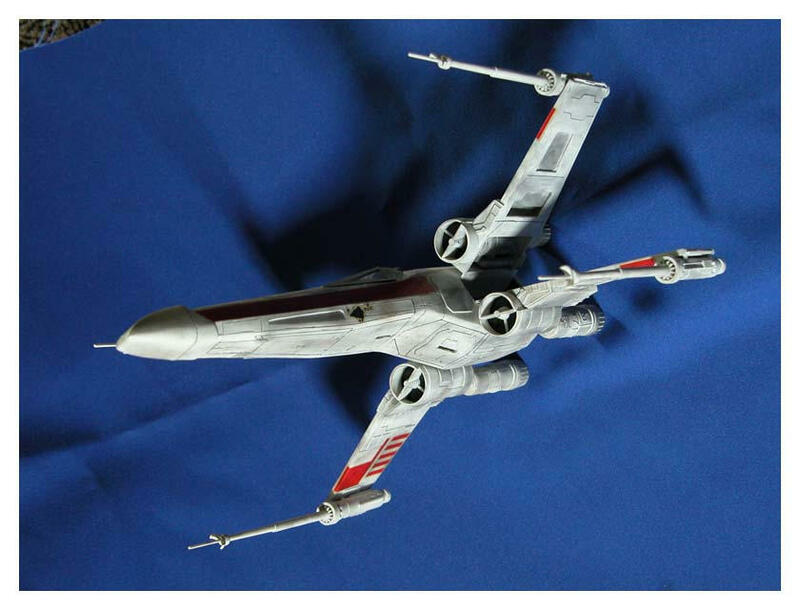 That red panel is landing gear that I preserved from the earlier version. 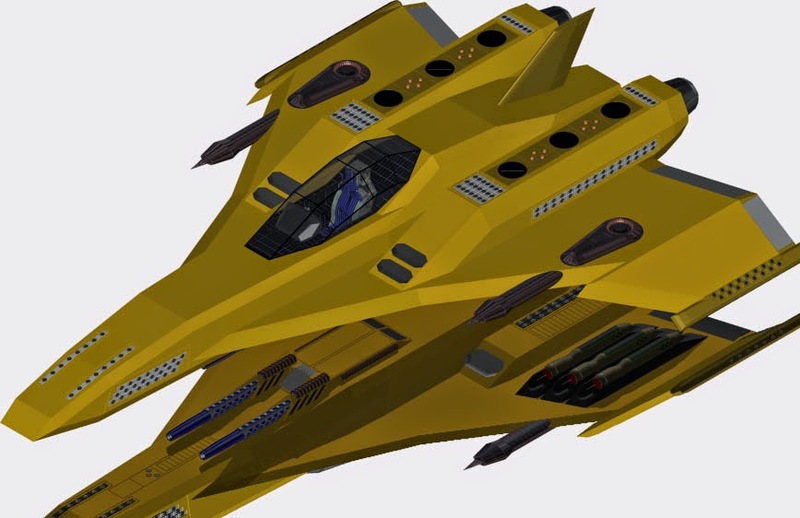 But that grey panel next to it, that slides away to reveal an internal missile bay. This is also a good time to point out the grills on the front of main engine. 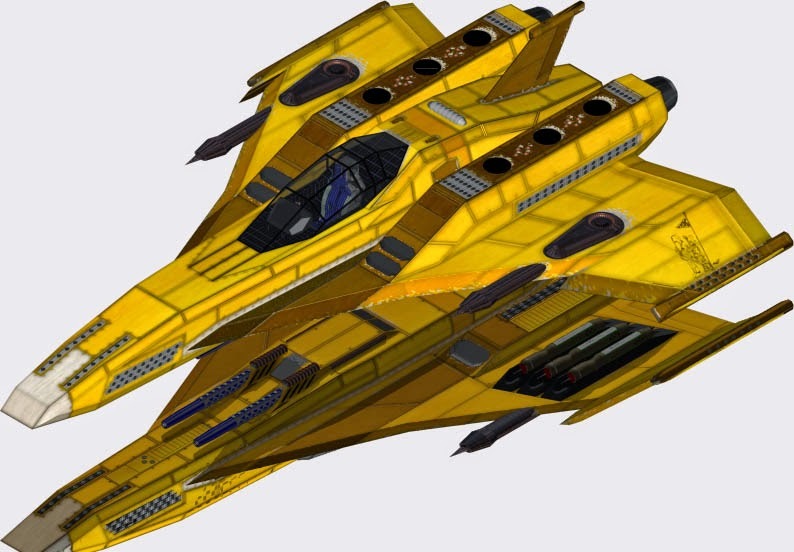 Those serve two purposes: #1 they are hydrogen ram scoops allowing the fighter to self refuel while on patrol or if it comes to a nice hydrogen gas giant. #2 they act as thermal radiators, venting away excess heat. Tt's all in the details. For the most part, the grey bits in these shots are parts that carried over from the last version or we only minimally modified to onto the new design. Next step texturing. 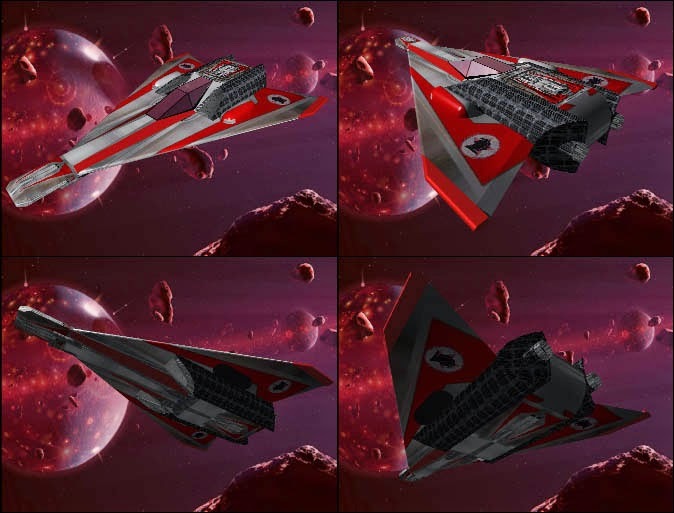 These images serve to illustrate how much easier the new texturing method is and how it has allowed me to create various schemes with much greater ease as seen with the trio of fighters that grace the cover of Spiral War: On Dagger's Wings.